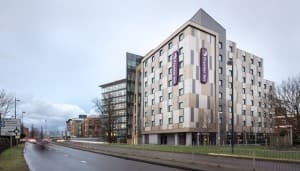 The attractive new Premier Inn at Maidenhead is a 124 room hotel with restaurant and associated support services space, plus a coffee shop and a double level basement car park, on the site of existing offices at Kidwells Park Drive. 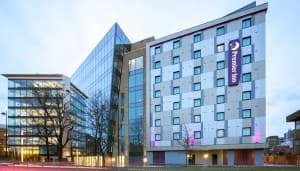 This is the UK’s first hotel with its own app, letting customers control their hotel experience, and the building features an architectural louvre screen supplied by Greenwood Louvre on its south elevation. Built by McAleer & Rushe, the structure was designed by White Ink Architects with Greenwood appointed to lend design support and product supply for the visually striking façade.